Umarex produce a range of high quality, realistic air pistols under license from the respective manufacturers, with this version of the Walther CP99 being a prime example. All of the proportions in terms of weight, size, and handling are as per the original, and the performance is excellent as well. The pistol uses an 8 shot magazine which takes the standard .177 air gun lead pellets, and these pellets are then fired down a rifled steel barrel. This barrel has been precisely made to ensure some of the best accuracy and consistency currently available. 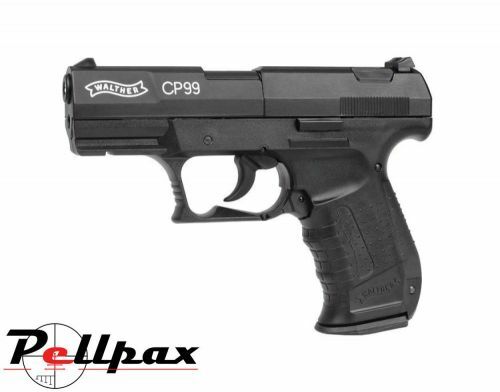 All this adds up to make the CP99 a perfect choice for target shooting and plinking purposes. Powered by the standard 12g co2 capsules, each one is loaded into the magazine which drops out from the grip for easy and solid loading of each one. Being a non blowback pistol, each capsule can provide up to 80 shots making the Walther CP99 perfect for those extended plinking sessions. The Umarex Walther CP99 is fitted with open sights as standard so that you can be on target, and additional sight accessories are sold separately so that you can customize your air pistol to your requirements. A front underside weaver rail permits the addition of accessories such as lasers and torches. Used by police, marksmen and collectors world wide the CP99 is used by all. The fast action system allows quick loading and even quicker discharge of the pellets. Also comes complete in a hard case.